I think that I can honestly say that I am addicted to the blog hops that are hosted by Rita of Jewel School Friends. She sends us out beautiful artisan beads and we get to design around them. This time around it was a pair of charms from Diana Ptaszynski of Suburban Girl Studio. I have always loved Diana's beads and charms, and this time was no exception. I knew that I didn't want to use them the typical way in a bracelet so I tried a few different ways to come up with a way to use them as a focal. I finally settled on a charm necklace. Now while I am very happy with the charm necklace idea, I am not satisfied with this necklace so I will be redoing it. I wanted to make a chain to hang it from but I needed to redo my studio so I could even get to the area where I have my metal. Thankfully that is done now, I just don't have time to make up the chain before the hop. So stay tuned and I will be showing this necklace off again once it is reborn. 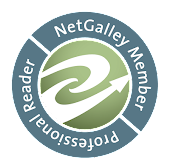 Now are you ready to visit a few other blogs and check out some real eye candy? I know that I certainly am with my cup of tea and a couple of my dogs curled up in my lap. The necklace design is so wonderful I can't imagine it getting better. But I look forward to seeing your re-do soon. The charm necklace idea was a great way to go with the anchors, and I love how you added the second charm to the back. I think your necklace is very pretty, but I understand about redoing it. I often finish something and then remake it. Even though the first effort is perfectly nice, it doesn't match the idea in my head. So I'm looking forward to seeing your reborn necklace! Noooo! Don't redo it! It is perfect as is! Just lovely! Redo...redon't! I love it! The components all come together in such a nice nautical way. I love the circle holding the "charms" because it looks like a life ring. I also love the chunky chain you've used as it represents something that you would tie the anchor to. Why don't you send this one to me and then you make a brand new necklace cause I just love it! Love the idea of a charm necklace! I totally get wanting to rework something when it doesn't match what's in your head. I do hope you keep the elements you've used, they look great! 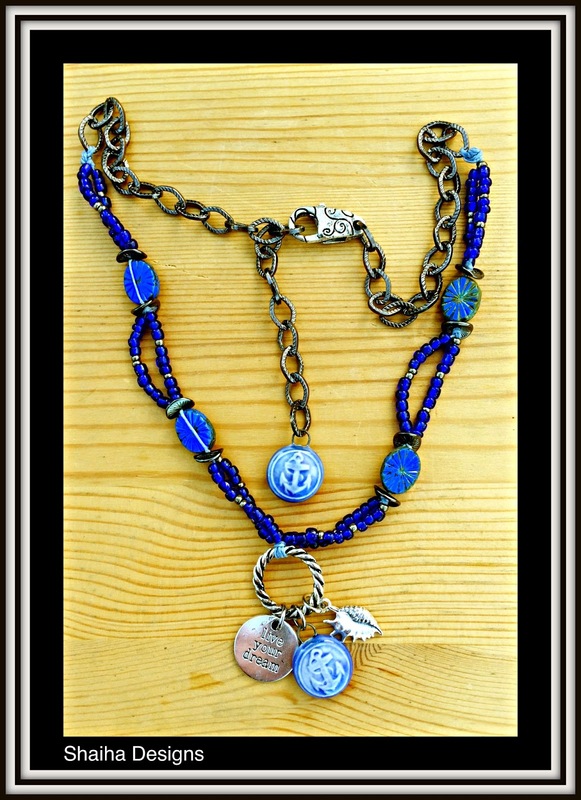 I love the colors you used and I think the idea of a charm necklace is very creative. I think you did a great job. I certainly don't think it needs to be remade, I think it is wonderful!!! Just Love it! Have a Blessed Day!!! Remarkable piece! 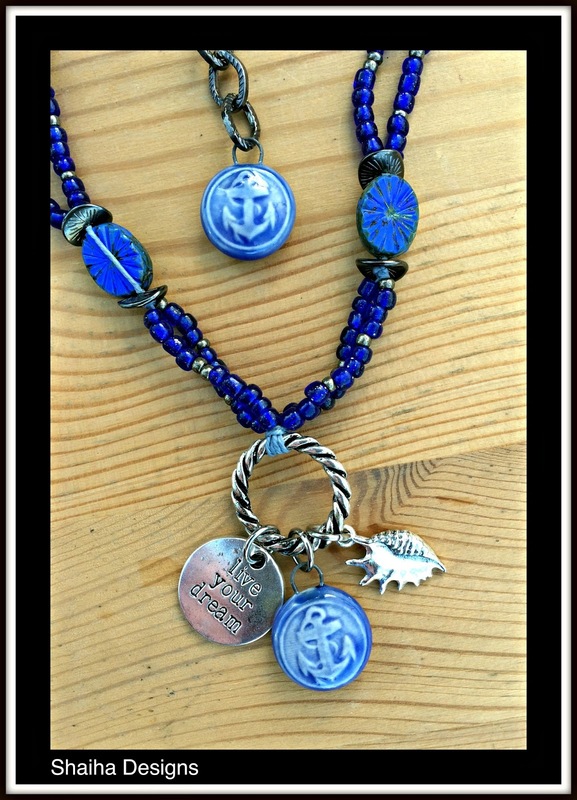 Love the colors, the charms, and the anchor! You're going to redo this piece?!?! I think it's lovely as is! We are our own worst critics. I'm happy with my earrings, yet the original idea that I had went into a panic attack. I hope to see many of the beads and components in your next design.